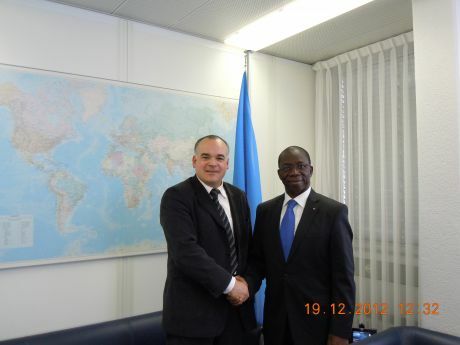 On the 18th and 19th of December 2012, Mr. Nenad Stankovic, ICPE Representative in Vienna, visited International Telecommunication Union (ITU) in Geneva. During his visit ITU Mr. Stankovic met Dr. Hamadoun I. Toure, Secretary-General of ITU, Mr. Brahima Sanou, Director of ITU Telecommunication Development Bureau, Mr. Jaroslaw Ponder, Europe Coordinator and Mr. Christopher Clark, Head of the ITU Sector Membership. In these meetings Mr. Stankovic expressed ICPE’s high-level interest and readiness to develop very close and strategic partnerships with ITU. He informed about new ICPE programmes/projects and ICPE’s decision to participate in the activities of ITU Telecommunication Development Sector as a Member. ITU officials appreciated meeting with Mr. Stankovic and supported co-operation between ICPE and ITU. As result of the mutual interests and visions, ICPE’s formal application was accepted and ICPE became ITU-D Sector Member. It was underlined that new ICPE status in ITU will give more opportunities for co-operation and benefits for both organizations, especially in exchanging information, developing new programmes, creating projects and implementing mutual activities in Information Communications Technologies (ICTs). It was agreed to intensify discussion and define the most appropriate proposals for concrete co-operation in the next biennium 2013-2014. Besides very successful meetings in ITU, Mr. Stankovic also realized official visits to UNCTAD (United Nations Conference on Trade and Development) and ITC (International Trade Centre). During his visit to UNCTAD, Mr. Stankovic met Mr. Torbjörn Fredriksson, Chief, ICT Analysis Section, Science, Technology and ICT Branch, Division on Technology and logistic of UNCTAD and Ms. Vlasta Macku, Chief of UNCTAD Virtual Institute. In this very fruitful meeting it was discussed what could be the next steps in co-operation between two organizations. Among other opportunities, ICPE was invited to participate in the academic community working under UNCTAD Virtual Institute. This proposal was appreciated by Mr. Stankovic and both sides agreed to continue dialog about this topic in January 2013. During his visit to ITC, Mr. Stankovic met Mr. Anders Aeroe, Director of Division of Market Development, Mr. Robert Skidmore, Chief, Sector Competitiveness, Mr. Martin Labbe, Online Marketing and Digital Networks Adviser, Enterprise Competitiveness and Ms. Aisatou Diallo, Senior Officer, Trade in Services, Sector Competitiveness. The main subject of this meeting was exchanging information about possibility for creating mutual programs, projects, trainings, events and developing mutual co-operation according to the ICPE programmes and based on specific needs of the member states. ITC representatives appreciated meeting with Mr. Stankovic and expressed interest to co-operate with ICPE, especially in organizing trainings and assistance to the least developing countries in the field of the trade and human capacity buildings. It was agreed to continue dialogue and exchanging of information with aim to find an appropriate opportunity for co-operation in the near future.